NETWORK FINALS: WINTER OLYMPICS coverage adjusted to 4.8, and ABC’s NBA game to 0.8. In addition, the rerun of THE RESIDENT lost 0.1 in final numbers. CABLE HIGHLIGHTS: NBC Sports Net’s piece of WINTER OLYMPICS coverage accounted for half of Saturday’s Top 10 cable slots, led by the afternoon broadcast at 1.31–and in the midst of that coverage, it also aired a TRACK & FIELD broadcast at 0.34. (Note that as usual, HBO listed its cable premiere of WONDER WOMAN as an “original,” although it’s worth noting that 0.85 is an excellent number for the network.) ESPN’s COLLEGE BASKETBALL sextuple feature was at 0.54/0.54/0.37/0.29/0.27/0.24. 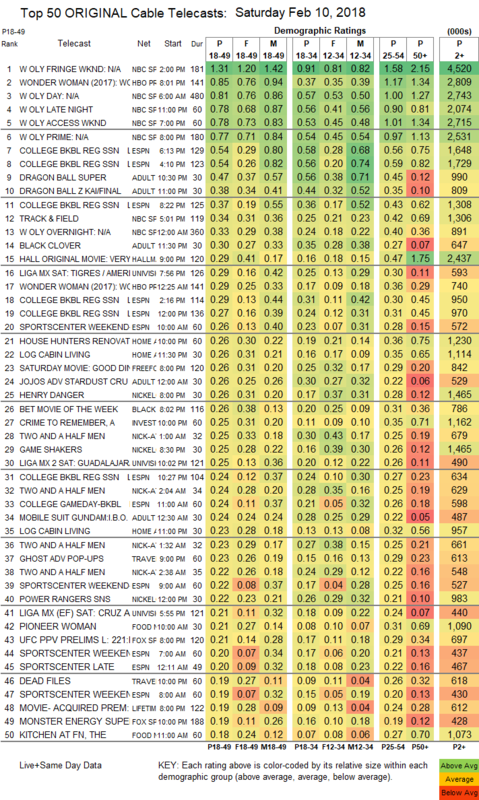 Adult Swim’s late-night block performed as follows: DRAGON BALL at 0.47/0.38 compared to last week’s 0.49/0.39, BLACK CLOVER steady at 0.30, JOJO’S BIZARRE ADVENTURES up a tick to 0.26, MOBILE SUIT GUNDAM steady at 0.24/487K, HUNTER X HUNTER down 0.02 to 0.22/452K, NARUTO down 0.02 to 0.21/423K, OUTLAW STAR down 0.03 to 0.17/343K, SPACE DANDY down 0.02 to 0.17/342K, COWBOY BEBOP steady at 0.18/362K, and GHOST IN THE SHELL up 0.01 to 0.16/293K. Hallmark’s original movie VERY VERY VALENTINE was at 0.29. A Univision LIGA soccer match was at 0.29. HGTV’s HOUSE HUNTERS RENOVATION dropped 0.04 to 0.26, and LOG CABIN LIVING was at 0.26/0.23. ID’s A CRIME TO REMEMBER was at 0.25. On Food Network, PIONEER WOMAN was at 0.21, KITCHEN AT FN fell 0.14 to 0.18, TRISHA’S SOUTHERN KITCHEN lost 0.05 to 0.18, and VALERIE’S HOME COOKING was down 0.04 to 0.14. Fox Sports 1’s UFC PRELIMS was at 0.21. On BBCAmerica, BLUE PLANET II and its follow-up were at 0.15/0.13, down from last week’s 0.18/0.17. USA’s FALLING WATER dropped 0.05 to 0.08.